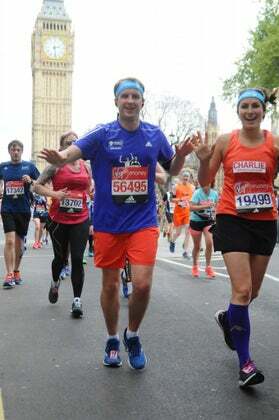 After a grueling race in Boston, The Runner Beans geared up to pace her fiance in the London Marathon less than a week later. 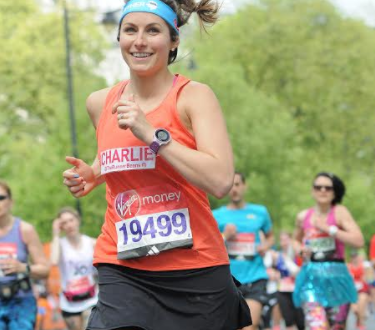 As a runner in London, the London Marathon is what everyone assumes you’re working toward. 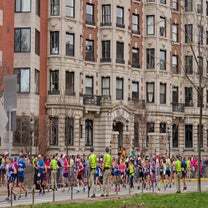 Mention the fact that you’re a marathoner, and they’ll ask you how many times you’ve completed the 26.2 miles from Greenwich to The Mall. For Brits, London is our Boston; the pinnacle of the distance running calendar. Last year I had to pull out due to injury, but thanks to much better rules in the UK than the US (sorry, but true) I was allowed to defer my entry for very minimal cost. My fiance, Tom, who’d run the London Marathon in 2015 despite, in his words, “not being a “runner,” was also keen to run it again, calling it his pre-wedding prep. I’d always joked that I’d love to run a marathon together, holding hands to cross the finish line. I was all set to run the London Marathon on April 23. It was to be my second marathon this year, as I was due to be running the Tokyo Marathon in partnership with a brand. Sadly, two months before race day, something went wrong with the communication and the Tokyo Marathon cancelled my race entry, leaving me devastated—and without a goal race. 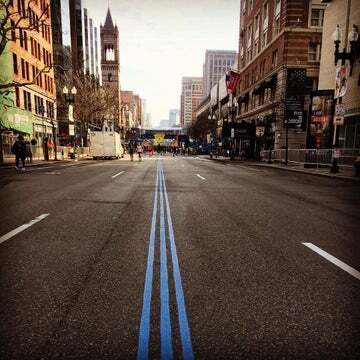 The only problem was, the Boston Marathon and London Marathon were six days apart. 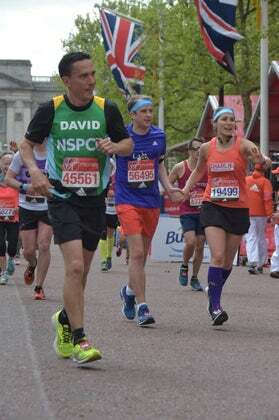 Everyone assumed I’d give up on London, but it’s my home city, my home race and possibly the only opportunity I’d have to run a marathon with my fiance. So training for both races continued. My goal for Boston was to run a PR—which was anything sub-3:49—however, I thought I had more of a 3:42-45 in me, given how training had been. Race day was tough, the heat zapped my energy and the hills took a huge toll on my quads. Those who say the only hills are in Newton in the back end of the race are either lying or don’t live in as flat an area as I do. I found the course brutal. I fought with everything I had, (even peeing my pants at mile 14 in desperation not to add any extra time) and at the end of the day, am proud of my 3:59 finish. I had a lot of what we’ll call GI distress upon finishing, ugly blisters, trashed quads and a respect for the distance that only comes after you’ve really fought your way to the finish of a marathon. With only five days of recovery before London, I was terrified. I had two massages to try to heal my aching muscles, sweet-talked my way to an upgrade and a flat bed on my British Airways flight back to London (such a quick and easy trip! ), and made sure to eat well and hydrate properly. I even made a trip to the Boston November Project at Harvard to flush out my legs before my flight! On Sunday morning, with my blisters taped up and body glide all over my feet, I felt relaxed. Aside from helping Tom run a sub-4:30, there was no pressure on this race. The sun was shining as we crossed the start line in Greenwich, and I made the decision to smile through any pain I might be feeling in my legs, but that if things got too much, I’d pull out. But the pain never really came. Sure, my quads felt like I was at mile 26 as we hit the 10K mark, but I was running at a comfortable pace, I was grinning my head off and taking in the atmosphere in a way I don’t think I’ve truly done during a marathon before. This wasn’t my race, but it was my lap of honor. I didn’t hit the wall. I was never out of breath. The sub-10-minute mile pace felt truly comfortable—just like an easy run—and I was able to spot plenty of friends along the race course. We finished in 4:22—a 22-minute PR for Tom—holding hands as we ran down The Mall (which was a PR for me)! I needed this race to remind me how much I love the marathon distance. To show that I was fit and well trained for Boston and put that joy of running back in my heart. 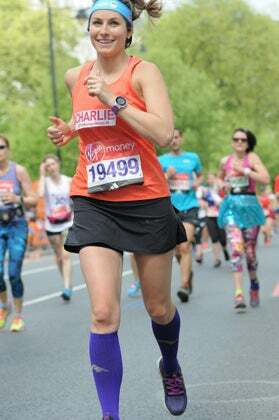 Now I feel I’m truly ready to work for that BQ again…also, I have the best race photos ever!